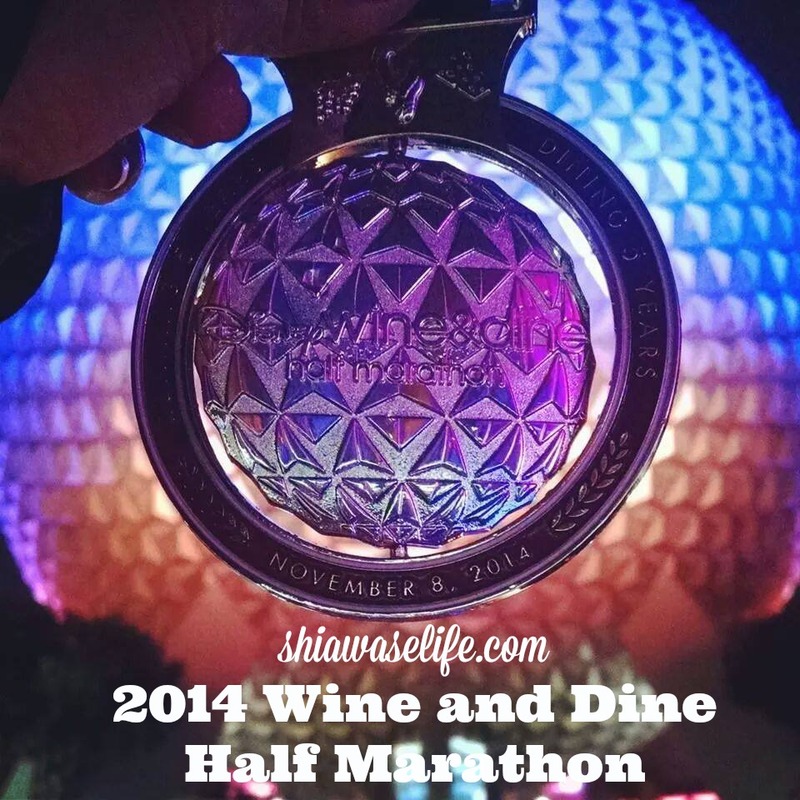 This past Saturday, I ran the 2014 Wine and Dine Half Marathon. It was my third running of the event (2012, 2013, and this year) and my 17th half marathon – and hands down, I know it will be one that I will never forget. But let’s start from the beginning, why don’t we? On the evening of Saturday, November 8, I found myself lounging in the comfort of our studio at Disney’s Boardwalk Villas. The air outside was damp and cool, and sprinkles were beginning to fall. Hubs, as per usual, was questioning my sanity – not only at the idea of running a half marathon in cold and rain, but, as usual, doing so in a costume. 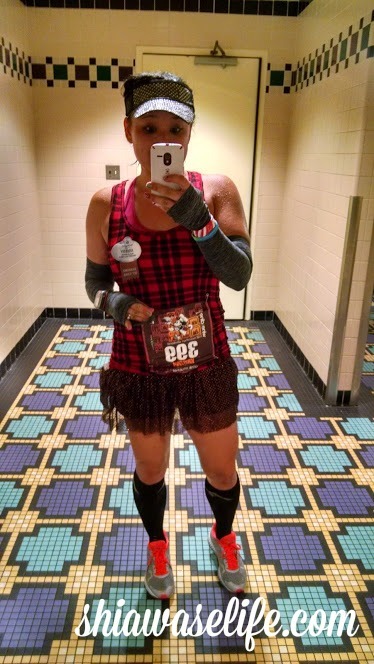 Of course, that’s a regular day in the life of my runDisney-loving self, so it wasn’t long before he was snapping my pre-race picture, and I was headed out to the lobby to meet with my friend Katie to catch the shuttle over to the ESPN Wide World of Sports (WWoS). We waited quite a bit (we got there really early – maybe 6:45 ish or so, and the first shuttles didn’t show til around 7:10) but once we were seated and on our way, we knew we were on our way to an adventure! At the staging area at WWoS, there was an air of nervous anticipation as we all speculated on what the night would bring. It was still dry then, though the air was chilled. I took out the necessary items from my drop bag (two ponchos for my friend Ashley and her hubby) then proceeded to hang out and relax. I was glad that I had packed an old throwaway tablecloth, which I offered to my pals as we waited for the time to be ushered into our corrals. Once it was time to do that, we migrated over – but not before stopping at the information tent to see Jillian, who was working the event! After a few pics, we seeded ourselves into our (small) corrals and started the next waiting process. Although the time can seem to take FOREVER waiting, it REALLY helps when you have friends to pass the time with. Along with Danielle and Amelia, we also had the pleasure of meeting rockstar/flockstar Audrey, who had just run NYCM the weekend before! We enjoyed dancing to the crazy music, laughing at insane commentary (“you must not be taking this seriously”) and bizarre shenanigans like watching someone bust out an umbrella before the race started. 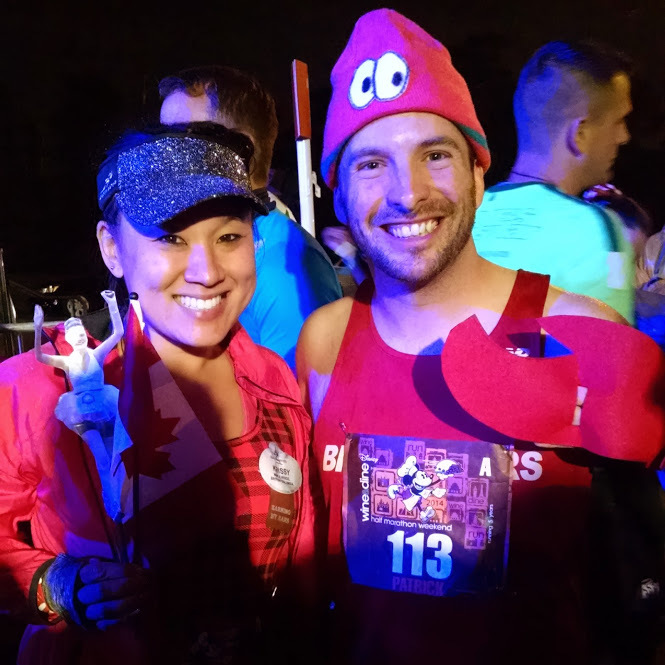 A Canadian and Sebastian the Crab walk into a bar…er..race. This was also about the time that my friend Patrick joined us in the corral, and we all briefly discussed goals for this race. We all agreed that it was more of a “see what happens” kind of night, especially with the weather, and when the gun finally did go off, we took off in a pack. …and then the fun began. That first mile was all about getting our footing. Even with the smaller corrals, there is something about having elbow room again, and we stretched our legs. I knew I wouldn’t be interested in running much faster than this pace, though through the darkness I could hardly see my watch anyway. 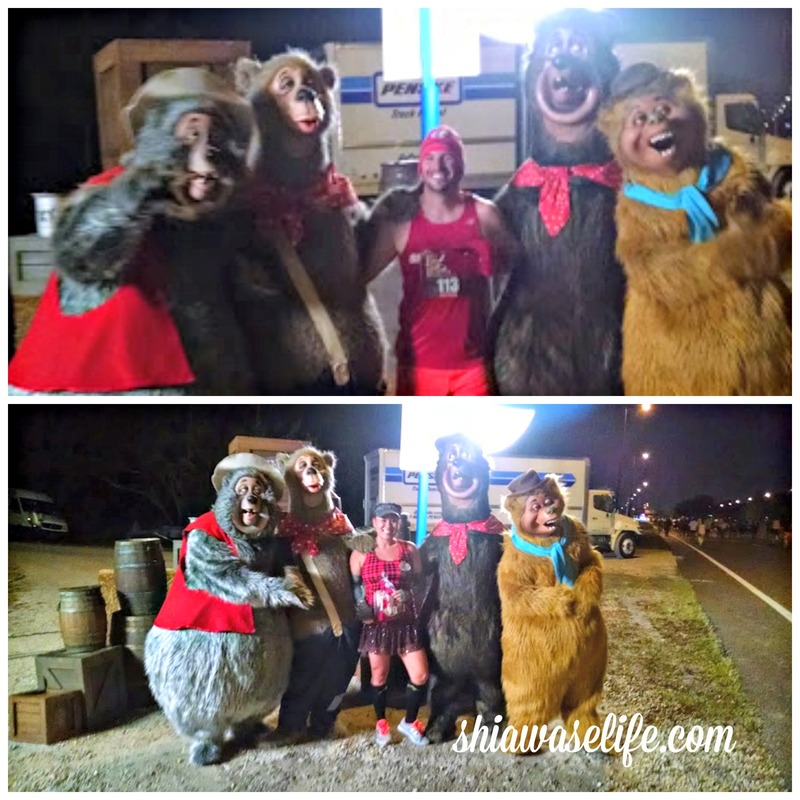 It started sprinkling about halfway through the first mile, and so we wondered if any characters would be out…when lo and behold, the grouping of characters that Patrick had just been lamenting about missing in a previous race were coming in to sight…the Country Bears! We had to stop for them! 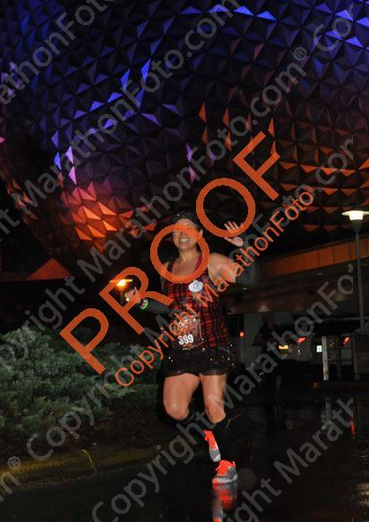 This was what I call runDisney’s version of “lonely highway” miles. The rain was picking up and there wasn’t a whole lot going on, but we were getting closer to Disney’s Animal Kingdom, so there was a certain level of anticipation. Patrick and I chatted about random running things and kept the pace up. The road was banked here as we rounded the corners, but soon enough, we were charging the parking lot and past the Electrical Light Parade floats on the way into the park. 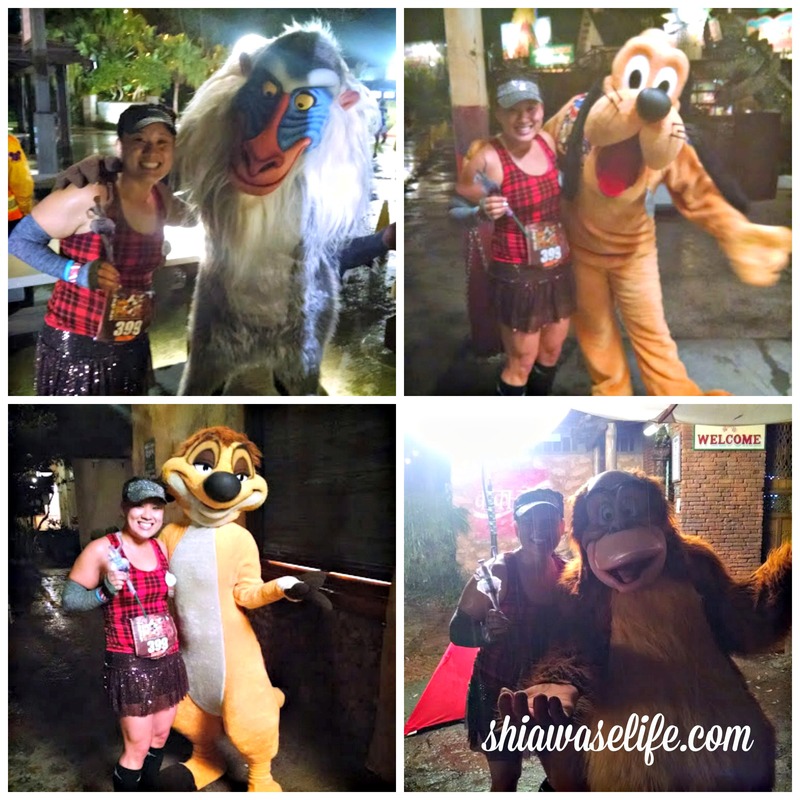 I have to admit, running through the theme parks is one of the biggest draws for me when it comes to the runDisney events, and it made me so happy to see a variety of characters out to meet and greet despite the increasingly soggy weather. Each character was a bit away from where they may have usually staged meet and greets, so they could be under cover. Somewhere in the park, I had lost Patrick, and remember being passed by Audrey, Danielle and Amelia, though I seemed to be pacing with a few other people who had the same idea as me (running from character to character). Haha! On the way out of the park, I saw a Pirate Ship (I mean, how often can you say that at a race??!) and I met Captain Jack and a fellow pirate! It was about this point that I saw my friend Justin! He was looking strong, and I chatted with him for a few minutes. 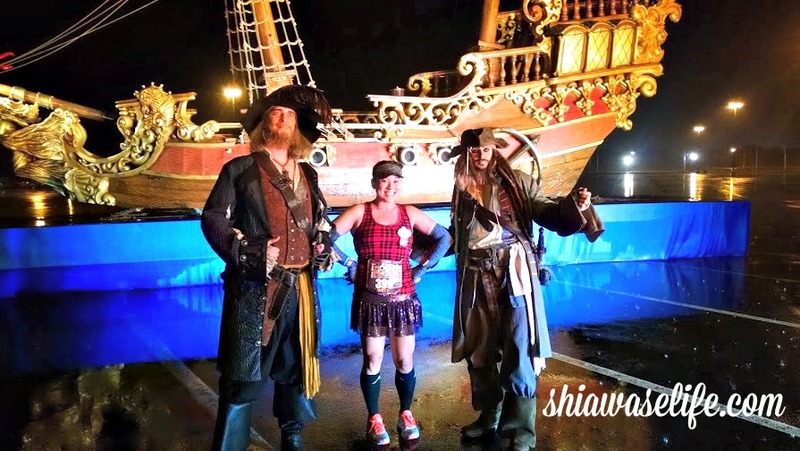 In the hugeness of runDisney races, it never ceases to amaze me how often you see friends! It is definitely a great perk! 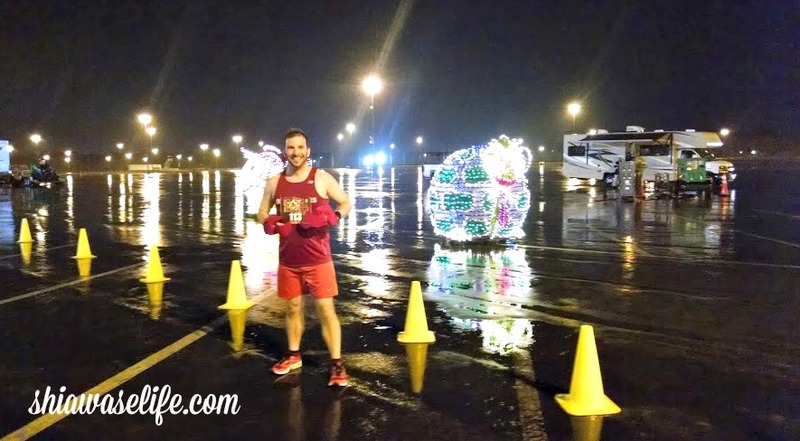 Lonely Highway Running Part 2…made more lonely since I was amiss of a running partner at this point, but to my happy surprise, I had a few shout outs from the other side of the divided highway! Thanks, Mikki, Rebecca, Tara, and anyone else I missed for shouting out “Krissy! !” and waving! It really gave me a boost. The ramps here between the highway and access roads into Hollywood Studios gave my legs the break they needed with a little hill work (wheeee down the hill!) and taroudn this time, I realized that I had to pee. Really bad. However, the idea of stopping at a waterlogged portapottie, with the wind rushing by was incredibly unappealing. Besides, there were lines! Ain’t nobody got time for that! …still have to pee. Ahhh! Fortunately, I was plotting my next move as we entered the backstage area of Disney’s Hollywood Studios. FINALLY! I made it to Sunset Boulevard and dashed into the (EMPTY!!) restrooms next to the Tower of Terror! Booyah! This moment required a (soggy) selfie. Then, off to run around the park – past Pixar Place – on and off stage – to the much anticipated glory of the Osborne Spectacle of Dancing Lights! I was still riding that Christmas-y high out of the park, and made my way down the paths that connect through the Epcot resort area. There were lots of spectators and cheerful volunteers that made this part fun, despite the second onslaught of hard rain coming down. We were in Epcot! The course wound backstage, where I used to walk when I worked at International Gateway, and out behind the Imagination Pavilion and the Land Pavilion. There were cheering fans and partygoers! Fun music! We were almost home!! Through the Innoventions walkways and out back behind Spaceship Earth and the entrance plaza! Let’s go! I love this finish line! There’s just something exhilarating about the pounding music, those last two smooth turns, and charging toward the bright lights! The announcer called out my name and I mustered up whatever was left and just made a run for it! My favorite picture from the event. 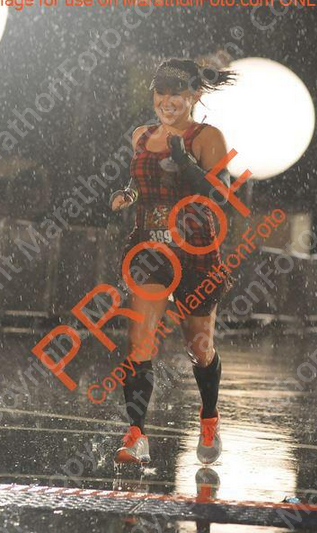 The rain drops were big, and my shoes were soaked beyond comprehension, but this wave of endorphins just took over. As soon as I entered the chute, I was happy to have Jillian guide me through, as I collected my medal, snacks and hydration! She helped me with the foil blanket, and made sure I made it all the way to bag check without issue, so I am so thankful! Each minute that passed after that, I felt my body temperature drop, so as soon as I was safe to stop, I pulled to the side and dug out my hoodie and poncho, layering the foil blanket over the top before making my way into the park. Oh, and I had to take a medal pic, of course! In so many ways, this could have been a miserable experience, but thanks to my friends, incredible Cast Members, volunteers, and fellow runners, it was quite the opposite. The race was unlike any other, and proof that success is determined when you prepare for the worst, yet always expect the best from yourself. What is the craziest race experience you have encountered? What made it unique? Great recap! You are one speedy runner!! It was great to meet you in the line for the bus. Conditions certainly weren’t perfect but we’ll always remember the Rain & Dine 2014! Aw thanks, A! I am so glad I got to meet you in person finally, too! I love reading your race recaps! I felt like I was there with you running right along side you! It has made me decide to sign up for this race for next year! Thank you Krissy for being you!! You are truly and amazing person/runner!!! I heart you, Jackie! And thank YOU for being you! Hope to run with you again soon. Your medal photo is the best! Thanks, A! That means a lot from a photog like you!! This is a wonderful post! Congrats on finishing! Now I’ll have to run W&D solely for the Christmasy effect. P.S. I love your blog layout. The pink and white is a winner! Crazy rain-but your photos still look so cute! 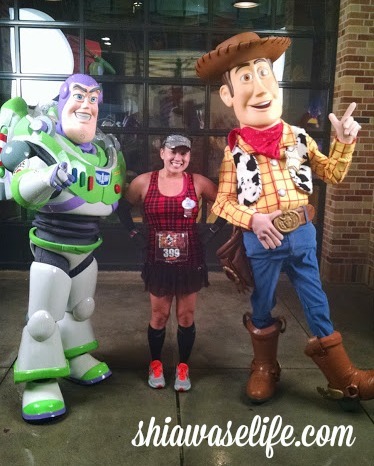 I really want to run a Disney race, just to go through the parks and see all the characters! I love your Epcot Canada Pavilion costume!! Since I’m married to a Canadian, it’s got to be one of my faves 🙂 Glad you had fun despite the rain! I love Wine & Dine so much. Wish I could run it every year! So awesome Krissy! This is probably one of the most positive recaps of WnD 2014 I’ve read, if not the most positive! Way to make the best of a slightly less than ideal situation! Thanks for stopping by to share the kind words, A! 😀 SO excited for you to rock your upcoming races!!! Despite the rain it sounds like such a fun race! 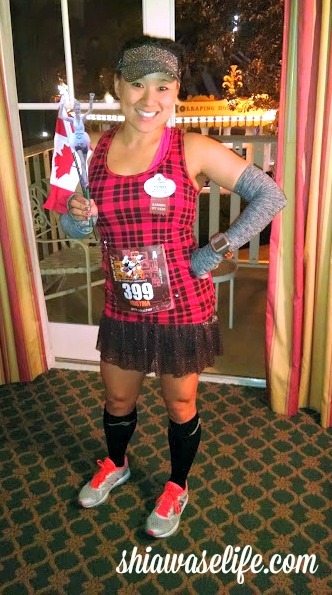 Maybe with Tower of Terror off the calendar for next year I will have to look into doing this one… I loved your Canada pavilion costume (obviously)! So glad you had a great time! We finished about an hour after you, it was a rough race! I walked more than I ever have, that rain was fierce! Definitely up there in the books with the Janauary half where it snowed! Congratulations on another great run!